If you're more interested in a wild adventure than growing roots on a sun lounger, head to Fiji on board a luxury yacht to experience adrenaline-pumping activities and expeditions. Superyachts up to 85 metres can moor at the Port Denarau Marina, offering the perfect base for discovering breathtaking Fiji. 1. Diving with sharks Don your scuba gear and head to Cathedral Reef on Tavewa Island, one of the best places to swim with sharks. Swim among tiger sharks, white tips, leopard sharks, hammerheads, bull sharks and grey reefs while ogling a myriad of other colourful marine life. Locals are keen to preserve the environment and to promote shark awareness, so each dive is run with this in mind. Additionally, for every diver taking part in The Shark Dive experience, $10 is donated to the local primary school. If you're more interested in a wild adventure than growing roots on a sun lounger, head to Fiji on board a luxury yacht to experience adrenaline-pumping activities and expeditions. Superyachts up to 85 metres can moor at the Port Denarau Marina, offering the perfect base for discovering breathtaking Fiji. 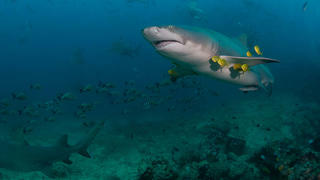 Don your scuba gear and head to Cathedral Reef on Tavewa Island, one of the best places to swim with sharks. Swim among tiger sharks, white tips, leopard sharks, hammerheads, bull sharks and grey reefs while ogling a myriad of other colourful marine life. Locals are keen to preserve the environment and to promote shark awareness, so each dive is run with this in mind. Additionally, for every diver taking part in The Shark Dive experience, $10 is donated to the local primary school. 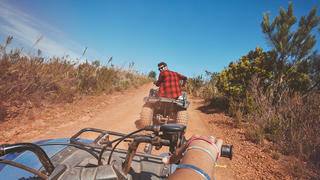 Take a quad bike around the incredible main island and tailor your experience – guests can choose to head up through the pine forests to visit remote villages before taking a helicopter tour of the island, or to speed out past the Sleeping Giant Mountain Range to the natural mud pools and hot springs. 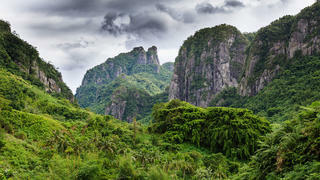 Alternatively, there are miles of emerald green rainforests to explore as well as crystal clear mountain lakes. Thrillseekers should opt for a ride up past Nadi for a truly exhilarating trip past cane fields, through large muddy puddles and pine forests and up mountainsides. Take a quad bike around the incredible main island and tailor your experience – guests can choose to head up through the pine forests to visit remote villages before taking a helicopter tour of the island, or to speed out past the Sleeping Giant Mountain Range to the natural mud pools and hot springs. Alternatively, there are miles of emerald green rainforests to explore as well as crystal clear mountain lakes. Thrillseekers should opt for a ride up past Nadi for a truly exhilarating trip past cane fields, through large muddy puddles and pine forests and up mountainsides. There are a number of guided hikes on offer, ranging from one to five day experiences. Keen walkers can push themselves to the limit by climbing the 1,323 metre Mount Tomanivi, an extinct volcano and Fiji's tallest mountain, while witnessing the stunning landscapes of the surrounding island. Climb dramatic peaks, visit faraway villages, cross the highlands of Viti Levu, swim in crystal clear rivers and discover hidden caves, all while enjoying stories and facts from your guide. There are a number of guided hikes on offer, ranging from one to five day experiences. Keen walkers can push themselves to the limit by climbing the 1,323 metre Mount Tomanivi, an extinct volcano and Fiji's tallest mountain, while witnessing the stunning landscapes of the surrounding island. Climb dramatic peaks, visit faraway villages, cross the highlands of Viti Levu, swim in crystal clear rivers and discover hidden caves, all while enjoying stories and facts from your guide. 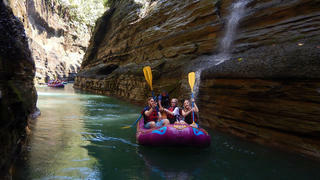 Those who don't want to head too far for the water can enjoy the winding rivers and rapids of Fiji by kayak. Challenge yourself by taking a tour through Upper Navua, where you'll see enormous canyons, approximately 70 waterfalls and the incredible wildlife residing in the surrounding rainforests. Get your blood pumping by paddling through narrow passages and through the Gorge's steep walls. Keen kayakers can opt for an eight day tour of Fiji, which includes river kayaking, rafting and motorised boat trips in order to cover as much of the island as possible. Those who don't want to head too far for the water can enjoy the winding rivers and rapids of Fiji by kayak. Challenge yourself by taking a tour through Upper Navua, where you'll see enormous canyons, approximately 70 waterfalls and the incredible wildlife residing in the surrounding rainforests. Get your blood pumping by paddling through narrow passages and through the Gorge's steep walls. Keen kayakers can opt for an eight day tour of Fiji, which includes river kayaking, rafting and motorised boat trips in order to cover as much of the island as possible. Home to the 2016 ISA World SUP and Paddleboard Championships, Cloudbreak is not a spot for the faint-hearted. Approximately 2.6 nautical miles south of Namotu Island, this reef is among the most challenging surfing destinations in the world, with waves reaching more than six metres in height. Alternatively, there are a number of surf schools so beginners can learn the ropes and set their sights on Cloudbreak. While the winter season (April to October) offers larger and more challenging waves, the summer season (November to March) will have lighter winds and warmer climates – perfect for anyone just starting out. Home to the 2016 ISA World SUP and Paddleboard Championships, Cloudbreak is not a spot for the faint-hearted. Approximately 2.6 nautical miles south of Namotu Island, this reef is among the most challenging surfing destinations in the world, with waves reaching more than six metres in height. 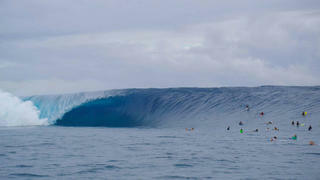 Alternatively, there are a number of surf schools so beginners can learn the ropes and set their sights on Cloudbreak. While the winter season (April to October) offers larger and more challenging waves, the summer season (November to March) will have lighter winds and warmer climates – perfect for anyone just starting out.